After those three minutes, I had the realization that I forgot to put the gate opener clicker in our “secret spot” so he could…you know…actually get in. Neil has always said that it’s impossible to surprise me, I can tell you that is entirely not true. After I “clicked” him in the gate and our dogs swarmed him, he climbed out of his truck with a bouquet of fresh sunflowers! These things were all as big as his head and the brightest of yellows! To say I was surprised is an understatement!! I LOVED them, and I love him even more for it bringing them home for us to enjoy. Sunflower surprises are the best! I’m not sure if he’s versed in the meanings of flowers when you gift them, but if so, he knocked it out of the park. Sunflowers are symbolic of: Adoration, Loyalty and Strength. What a beautiful sentiment for our relationship’s current long-distance situation. GUYS!! Even if she says she’s not into flowers…get them anyway. Just do! He never ceases to amaze me and we were so happy to have him home with us, briefly but we’ll take what we can get! The next day was planned to the tee and as what happens most of the time with plans…we veered off course. 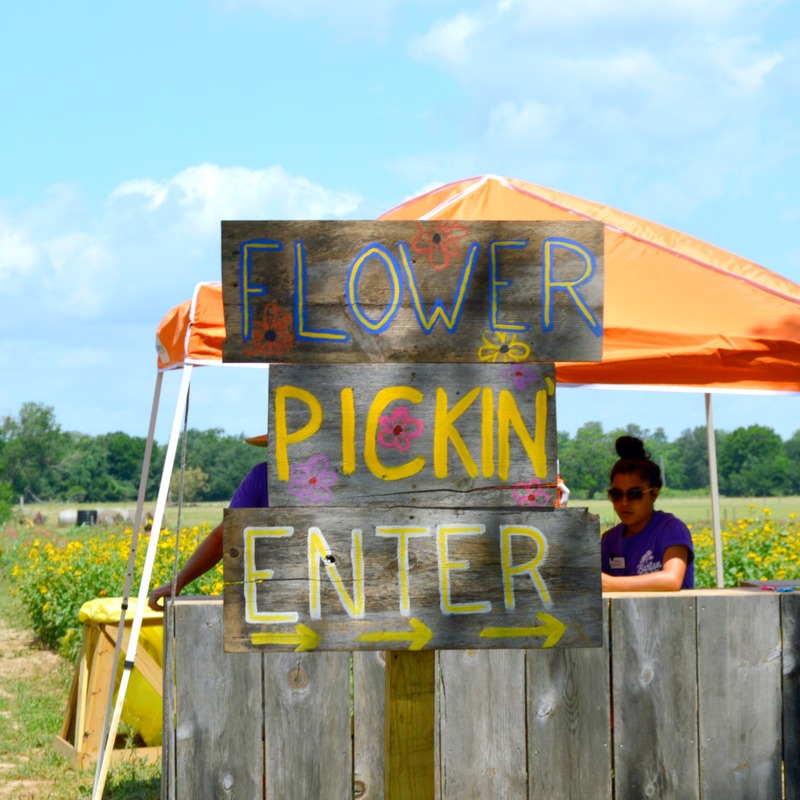 Our first stop was to the Wildflower Festival at Barton Hill Farms in Cedar Creek, TX. Neil planned, sketched and built the picnic tables that are currently being used at the farm about six years ago when they first opened and we moved back to the area from Corpus Christi. It was a really special moment to revisit his past projects and be able to share them with Kaya. Even if she didn’t realize her Daddy made the pieces that she was crawling all over that morning, it was still such a cool experience! By the time we got in (and realized that we FORGOT the stroller….DON’T FORGET THE STROLLER), it was eleven something and time for Kaya’s lunch. We strolled over to the concession stand after getting our bearings (it was a shock how open the area was! You could even walk over and see the river!). Grilled cheese…perfect, and I brought an applesauce in a pouch for her from home. Neil ordered a hot dog (and went back for another later, before we left plus got some super addictive kettle corn lol) Not hungry myself, the lemonade caught my eye…yes please! After lunch, we made our way over to what looked like it could have been a younger toddler crowd. Kaya is 17 months, and was still younger than all of the kids by probably a year. Fortunately, they had some great activities for even the youngest of toddlers! We found a big swing under the tree near the entrance to get off our feet and enjoy the breeze without the heat beating down on us, it was so nice! They had a Tic-Tac-Toe area (mostly, she liked the colors and movable pieces). The rustic bubble station was a HUGE HIT!!!! We couldn’t DRAG her away from it! They had a face painting area that we really wanted to try, but weren’t sure how she’d react so we decided to wait until next year or later this summer….things to look forward to! There were TONS of activities for older kids, in addition to what the little guys had to offer…Playgrounds, Trike Racing, Slides, A really cool looking Bean Bag Toss and Double Daily Crafts! There was Live Music at 11am and sprawling picnic area! I could see so many birthday parties here or group outings, field trips, So. Many. Things! One of the best parts were the tented table areas. Let me tell you, we were MELTING by 11:45am. Those tents and really any shaded area there were lifesavers! It was so nice to have some shade and a breeze. It was perfect for reapplying sunscreen and taking a breather. Going into the festival, I wasn’t entirely sure what a wildflower festival was or what to expect from attending one. I was THRILLED to learn that we could actually pick the wildflowers themselves to take home with you! You had a limit, but it made such a nice bouquet! Two bouquets in one weekend, we ARE lucky girls! 1) Bring a Stroller!! This was our biggest mistake. If we brought it, I’m sure we would have stayed longer. We just had way too many things to carry and our toddler to keep track of. 2) Buy your tickets online! You’ll save a few bucks! 3) Don’t forget hats, sunscreen and reapply often! 4) Ask the staff to take photos! We were not disappointed in the quality of the staffers’ photos of our family and they’re SO happy and willing to make your time there perfect! After the festival, we debating going to a music festival held in Bastrop, the first one that Neil’s hometown had put on ever, but decided it would have just been TOO much for the little one. It was already past nap time, and we all know…the schedule rules ALL. What Texas hot spots do we need to check out next?? Read more about our weekend in our next post…Challenge Accepted: Date Night In!